A man had to rescue his mother from the second floor during a fire that allegedly began over a box of Cheez-Its. 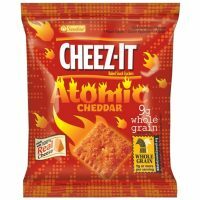 The incident started when an argument began over a box of Cheez-It snack crackers. That’s when one of the brothers, who police say was intoxicated, locked his brother and mother inside the home and began pouring gasoline on the front steps. He then lit the home on fire, trapping the two inside. The brother was able to lift his mother down from the second story window and then get himself out safely. The man who started the fire, 32 year-old Jeremy Lamar Wyatt, was taken into custody. He is charged with arson and criminal damage to property.